Justin is amazing. He did such an incredible job on our wedding day. He is so easy to be around and is great at directing everyone so we didn't look awkward or forget to smile. He and his second shooter Michael were loved by all of our guests, everyone kept coming up to me both at and after the wedding to tell me how nice they were and how great they were at capturing every moment. It was a long day and at the end of the night Justin went home and sent us a few photos from the day, it was so beyond what we expected and so appreciated. I cannot wait to see the rest of our photos, they are going to be amazing!!! Super easy to work with. His eye for scenery in our photographs was absolutely amazing! We have been so happy with all our photos and plan on using him for family and maternity photos too. Justin Lee did our engagement and wedding photos and exceeded our expectations. He was really fun to work with, easy to contact and his pictures are absolutely amazing. We couldn't be happier. My husband and I will recommend Justin Lee to anyone for any of their photography needs. On the day of our wedding, we had a carriage ride waiting for us as we exited the building and Justin was running down the street still taking pictures of us in the carriage as we were pulling away. He goes above and beyond, takes pride in his work and truly cares about proving phenomenal photos. Side note: If you get married at the Adrianna Hill Grand Ballroom he is definitely the person you want to work with. It is a romantic venue with dim lighting which can be challenging for a lot of photographers to capture the feel. Justin has a lot of experience working at the venue and all of our pictures turned out beautifully and we are extremely pleased with the results. Justin brought two other photographers with him that he trained and they worked really well together. One of the assistants was scheduled to dedicate an hour to working the photo booth, however we had a group of people that wanted to take more after the time was up so Justin ran over and took several more pictures. He took the time himself to take care of the guests. We highly recommend Justin, you will not be disappointed. Justin was one of the very best choices my husband and I made for our wedding. Not only did he take fantastic photographs for our engagement and wedding but he made the entire process easy and comfortable. For people who aren't used to getting professional photos taken it was so nice to be put at ease and helped to take natural, candid and really beautiful photos that we'll cherish for a lifetime. Justin was great!!! He had many great ideas of his own, and yet was willing to work with us to create the setting we wanted for our pictures. 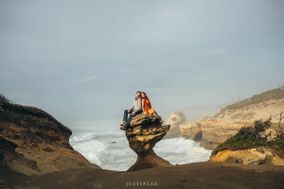 His innovative ideas and his second shooter made for some incredible photos! So pleased with his work!!! Pick up the phone and nab this guy before someone else does. His shots are stunning. The light, the energy, the colour! He has an artistic eye, and does a variety things with light, camera angle and focus that bring out the best in any subject. He was a calm and unobtrusive presence in an otherwise emotional and sometimes stressful day. He captured the intimacy and love--the absolute joy of each moment with great tenderness and poignancy. His love for his art really shows in what he was able to bring out in the pictures we received. SO lovely. Thank you , Justin. We are so glad for these beautiful memories..
First I wanted to add that this is way overdue. Justin did our wedding back in 2015 and was AMAZING. I want to add that when we hired him in 2015 he was just starting out but already blew our mind of how professional, responsive, caring, and skillful. I can't imagine how much better he got in 2 years. I would sit here and type out full description on how he was at our wedding but I would use every positive word in the dictionary. Honestly people just hire him you wont regret it. Meet with him and you will know haha. My wife and I plan to hire him again when we have hopefully have kids. Thanks Justin! One of the greatest parts of planning our wedding was having the opportunity to meet and work with Justin. When my fiance and I got engaged the first vendor we began searching for was a photographer. We interviewed 10 people and found Justin to be one of the most driven, professional, and talented people we had ever met. We went to multiple locations for our day long engagement shoot with Pacific City being our final destination where Justin literally took a wave for us (luckily his equipment was all okay)! Our wedding venue had pretty low lighting, but Justin went multiple times before the wedding day to figure out how he was going to be able to get the best pictures in the space. He and his team rigged up an entire lighting system and they were able to get the most gorgeous photos! Justin was such a pleasure to work with and I am so grateful he was a part of our special day! Justin was great to work with from beginning to end. He was very flexible and always responded quickly whenever we needed to reach him. He went above and beyond to take great pictures for us. All of our friends and family loved him and the pictures he took. We couldn't the more pleased. Definitely worth it! Thank you justin for your hard work :) We will definitely recommend you to anyone who is looking for a photographer! Justin is a truly talented photographer who is incredibly passionate about his work. I usually hate getting my photo taken but Justin was very easy to work with. Justin was very flexible and adaptive, which was very valuable for our somewhat unconventional wedding. My husband and I were also impressed by how creative Justin was; his great eye and style yielded some really unique photos. We would recommend Justin as a photographer for any occasion! Justin Lee was our wedding photographer and we were extremely happy with his services! His photographic skills and creativity are unsurpassed. He exudes professionalism and friendliness. I give Justin Lee the highest recommendation. I had asked Justin to shoot at my wedding only a month before my wedding. So to say he was very flexible is an understatement. He was easy to work with and very considerate. Even though I asked him only a month in advance he still gave me brilliant engagement photos and gave me everything I needed. Posted longer version reviews on theknot and yelp ... character limitations here won't let me paste it in. So long story short, I would say Justin is a very nice person and a very good photographer, but I would not characterize him as extremely professional. Your mileage may vary, but I predicted that we would be waiting an extra long time to get our photographs back, and we wound up waiting even longer than that. Additionally, we ordered albums as Christmas gifts for our parents immediately after we had received the photos, and even though Christmas was months away, we didn't actually get the albums until January. In general, we liked the photographs ... but the delays getting everything afterwards were unacceptable. Communication throughout was also very hit-or-miss ... would sometimes takes several days or even additional requests to get a response from him. Please see other sites for more detailed review.